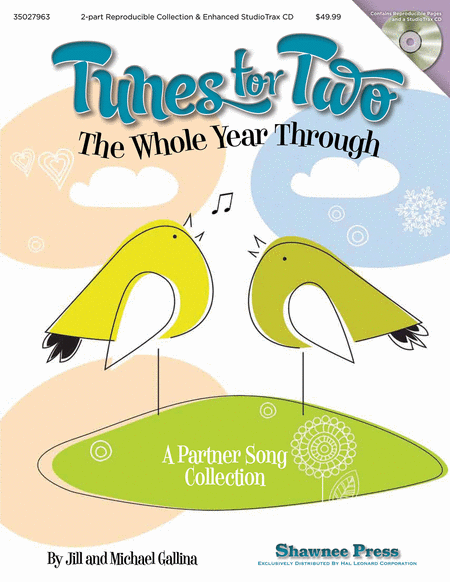 Tunes for Two the Whole Year Through is a versatile collection from Jill and Michael Gallina of their best-selling partner song chorals. A perfect way to present the major holidays that occur during the school year, each of the themed songs can be used successfully as classroom lessons or as stand-alone chorals for concerts and performances. Use with any 2-part mixed voice choir of any age or size including elementary or middle school singers, community choirs or senior citizen choruses. This budget-stretching Classroom Kit contains a 2-part collection as well as an Enhanced StudioTrax CD that includes accompaniment and performance tracks, reproducible singer's parts, poster, program, clip art, and composers' info. A BONUS linking and rhyming script gives the opportunity to stage short revue-style performances making this an indispensable partner song collection for your choral or general music library! For Grades 3-6.